he was gone by the time i started bumbling into may bugs. i found them crawling across the old pine hutch, the one i almost burned down one night long ago when a candle took a fancy to the century-old wooden knobs. 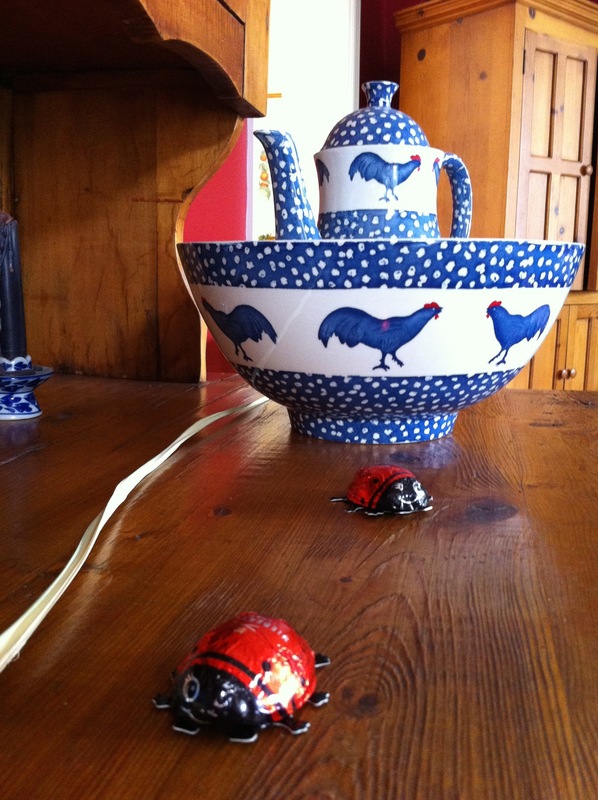 i found the spotted-back bugs slithering across a chinese bowl in the living room. i found them parked and preening smack dab under the daffodils on the dining room table. they were but the latest charmed import from the charming fellow who called this old house home for the last two weeks of chilly, drizzly april. and — in a role we’ll never forget — bernd was also the big-hearted papa who late into the lonely nights last summer sat beside our little world traveler, the one who’d trekked to germany and found himself topsy-turvy. even as the midnight hour came and went, bernd never left our little fellow’s side as he heaved his traveler’s tummy and wanted, more than anything, his faraway (and passport-less) mama to airlift him home sweet home. you don’t forget a man who soothes your child’s tangled heart. who, for days on end, pedals beside him on miles-long bike treks through munster’s leafy arbored tunnels. and buys him ices at the finish line. it’s a multi-chaptered friendship now, what with all the criss-crossings of sea and sky. and the shared knowledge that we’ve loved each other’s children as if our own, for the few short weeks they’ve been in our care. and this time round, we got to be the ones to unfurl the welcome mat for bernd. to tuck spring beauties by the bedside, wrap the empty mattress in the softest flannel sheets, fill the fridge with meats and cheese and toothsome breads, because we’d been schooled on how to feed a touring deutsche mann. the bed is empty once again, the footsteps now are stilled. bernd, one of the liveliest minds i’ve encountered in quite some time, has packed his bags and climbed aboard a train, leading his flock of westphalian schoolchildren down to where abe lincoln roamed. but for the better part of these past two weeks, we shared our house, and felt our hearts wedge ever wider. it’s what comes when welcome lasts for days. it’s that rarest of alchemies, the one that tiptoes into your very soul, and settles in at the comfiest nook. it’s mixed and poured in the shared pulse beat and the daily rhythms ticking through the hours: the soon-familiar rustle of bare feet on bare floor above. the flushing of the morning drain. the coming to know that the extra coffee mug now queued beside the pot is the one that takes a glug of what you now know to be vollmilch, whole milk. it’s something sacred, i swear, this slow-unspooling tête-à-tête and cœur à cœur that comes only when circling in close proximity over the course of added-up days. and, like all that matters most in life, it’s an arithmetic of the most elemental units, combining to intricate — and breath-taking — calculus. when we inhabit the same four walls, when we come to know by heart the waking up and slumber, when we pass a bowl of lumpy potatoes across a table, swap sections of the news, when one conversation circles back and round again, when we are interlaced across the span of sunlight and moonlight, when we share the itty-bitty worries of the day (was any school child lost in the trudge across chicago’s loop? ), and when one of us applies the ice to the other one’s purpled and twisted wrist (after a spectacular late-night fall that’s left me typing with one hand), we are more than simply friends. we are bare-hearted humans who inch closer and closer to a shared vision of the world. sympatico, “having a fellow feeling;” sym derived from syn (greek, meaning “together with, at the same time”) + pathos (again, greek, for “suffering, feeling,” or “a quality arousing pity;” related to penthos, “grief, sorrow”). it is what happens, over hours and days, over the pirouette at the refrigerator door when one reaches for juice and the other for cheese, over the turning out of the kitchen light when at last it’s time for bed, over the considerate hauling out of the trash, and the remembering to keep the cat from the allergic guest’s pillow. it is what’s bound to come — a sort of elmer’s heart glue — that’s applied in drips and dabs across the days. it’s our natural inclination to harbor the wholeness — the light and shadow, the fine-grained and the sweeping brushstroke — of those with whom we share dirty dishes in the sink, whose toilet paper rolls we make certain are plenty, whose soggy socks we whirl through the dryer. it’s as if we’re erasing, hour by hour, the walls that keep any two humans apart. we realize — because we hear the gurglings of everyday life, we scour the sink of another morning’s whiskers, we laugh out loud at the same wacky lines on SNL — how very much we inhale and exhale the same few molecules. and, thus, we get that rare peek at the truth: we are all but a bundle of quirks and soft spots, we all get goosebumps when it’s cold, and our tummies growl when they’re empty. and beneath the physiologic kinship, we unfurl the thoughts and ideas that animate our imaginations, we hold our native lands up to the light, and we discover that the globe is a very small orb, and our hearts are at their glorious best when we remember once again how deeply connected we all really, truly are. to say nothing of the rich parade of chocolate bugs that melt across your tongue, and leave a lingering sweetness that won’t go away anytime soon. 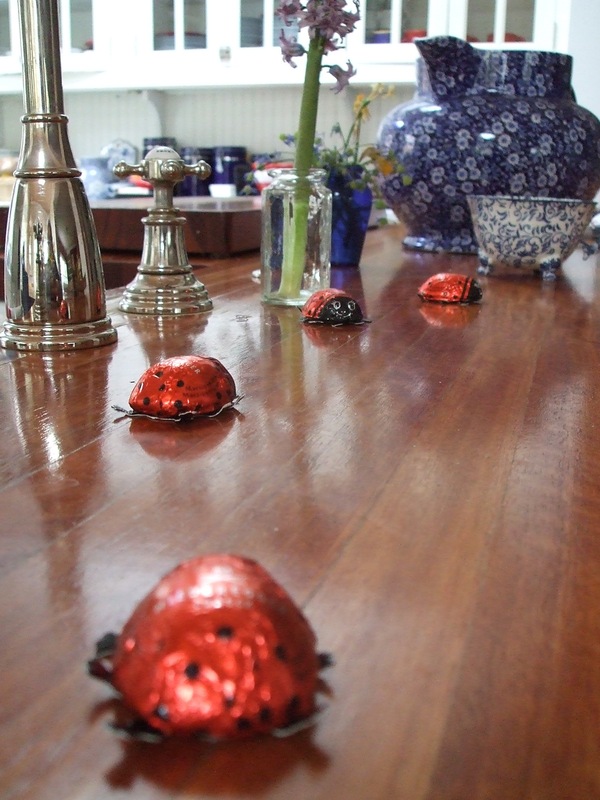 the chocolate lady bugs, it turns out, are a may day tradition in germany, when kinder (that’s children) wake up to find a trail of tucked away “may bugs,” all begging to be found. not unlike our easter egg hunt, and similar in spirit to our long-ago may-day tradition of secretly dropping a basket of spring beauties on some unsuspecting someone’s doorstep, it’s a hide-and-seek i’m now adding to my annual repertoire. and every time, my heart — like the milky chocolate — will melt, thinking of dear beloved brilliant bernd. who made our april not dreary at all. despite the temps in the 30s and 40s, and the rains that would not go away. do you have tales to tell of long-term hospitality, the gift of opening your home and finding a new inhabitant at the tenderest spot of your heart?